The second annual Goldrush Music Festival took place at the Rawhide Western Town in Chandler, Arizona on September 29th and 30th. It was a weekend full of surprises, good music, amazing vibes, great food, and so much more. Relentless Beats put on a stellar production once again. Despite the inclement weather on Sunday, it was a nonstop action-packed weekend. If you have not been to a Relentless Beats festival before, we highly recommend it. You’re in luck because they will be hosting BOO Arizona very soon at the Rawhide Event Center on October 20th. When we first stepped into the venue on Saturday, it felt like we had gone back in time to the Wild West. The old Western themed venue gave off an authentic and genuine feeling. It looked like a backdrop for an original Western movie. To top it all off, employees dressed to the tee in theme related outfits. All the attention to detail really brought everything together for an enhanced festival experience. There were four stages including the Goldrush Stage, Pioneer Peak, The Hideout, and The Wagon Wheel. We really enjoyed the Wagon Wheel and Hideout Stage since they were not as crowded and had a true Western vibe to them. The other stages were massive with larger than life sound systems that had captivating LED screens, lasers, strobes, and other fun lighting effects. A ferris wheel overlooked the main stage, which was a sight to see during the evening as the stunning lasers and pyrotechnic effects lit up the venue. The sound system complemented the wonderful music being played from start to finish. A range of diverse musical genres from EDM to hip hop were showcased throughout the weekend. 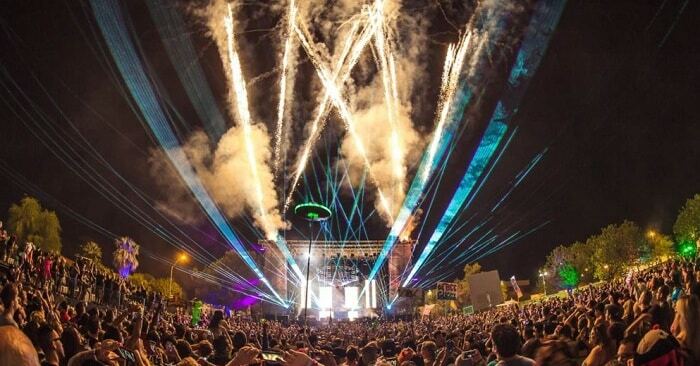 Relentless Beats rounded up some of the biggest EDM artists such as Deadmau5, Illenium, Steve Aoki, Deorro, and many more to play at Goldrush. Hip hop acts like Kevin Gates and Vince Staples also graced the stage to throw down a goldmine of amazing sets. Goldrush ended at 2am on Saturday and 1am on Sunday, but the party continued until later in the evening at the venue next door. The Superstitions After-Party included a Desert Hearts takeover featuring the original core four of the movement who performed until 4am. The after party presented a great opportunity to unwind from a long day of walking around the festival grounds and was a time to continue getting your groove on. The scrumptious variety of food vendors at the festival made it a bit tough to decide on where to eat at times. It was easy to satisfy your hunger with a delectable spread of food offerings such as pizza, chicken wings, and nacho fries. This year’s installment of Goldrush was a huge success. Shralpin would like to thank Relentless Beats and everyone who made this event possible for another memorable weekend. We look forward to attending more events soon. Catch you all next time!